If you want to be prepared for the rain and to play Harry Potter then this Harry Potter rain poncho is what you need. The poncho comes in a nice yellow pouch that says “Hufflepuff” on it and inside you will find a rain poncho that looks like a robe from Hufflepuff complete with printed on logo shirt and tie. This is just perfect to have in your bag when you go out as you never have to get soaked again and even if you want to do some cosplay then this poncho is ready for quick action too. The Harry Potter rain coat is one size fits most and it will look great on both men and women but you have to like Harry Potter for sure. 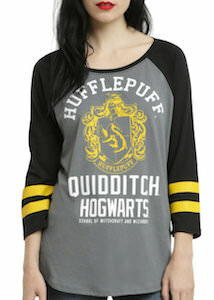 If you want to dress up Harry Potter style then this women’s corset top can make you look like a Hufflepuff member. This corset top is yellow and black and has a little necktie and a lace up back. The necktie is removable so that you only have to wear it when you want. The sleeve less top is great for any dress up occasion. 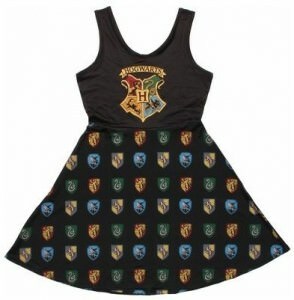 You can get this Harry Potter corset top in women’s sizes Small – 3XL and it is just perfect for cosplay and Halloween. Why wear a Harry Potter style robe when you can look way sexier in a corset top like this. 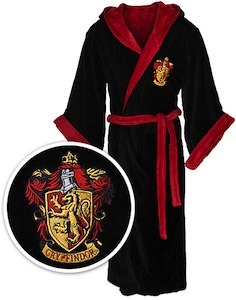 Now you can get your own Harry Potter bath robe. 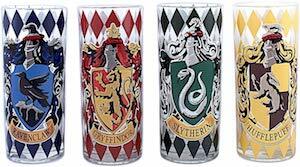 There are 4 version after the for houses in Hogwarts. Version and each are black with a lining and edges in the house color and a big crest on the front. 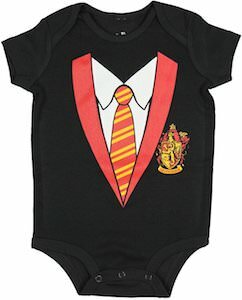 The Harry Potter bath robe is one size fits mosts. It fits a waist up to 55 inch and is 55 inch tall with 20 inch long sleeves. 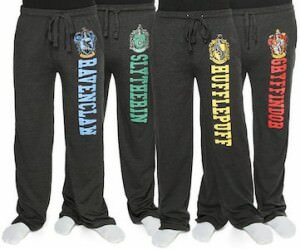 Now you can be all comfortable in your 100% cotton bath robe while you are rereading Harry Potter. 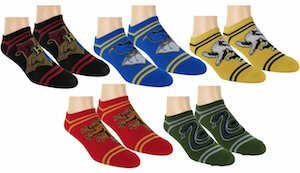 Come check out all the versions of the Harry Potter Bath Robes.